My great-grandma was the kind of person that never threw anything out. It got so bad that we eventually had to kidnap her and throw all of her junk out because all she had was little paths running all through her house. Herb and Dorothy Vogel remind me a lot of my great grandma. Only, they didn't collect doilies and spoons from Baskin-Robbins, they collected art. A lot of it. 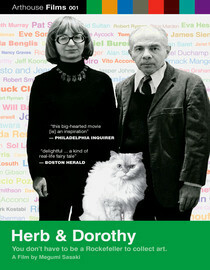 Herb & Dorothy is a documentary about the Vogels. He was a postal clerk and she was a librarian. They look like they could be anyone's sweet little grandma and grandpa. Like most couples that last as long as they did, they shared a common interest that provided constant excitement: art. When they were still young they realized they weren't exactly the artist types but they loved being surrounded by beauty. They were people of modest means but that didn't stop them from collecting art. They went out and started meeting young artists in the New York area and they would buy their art while it was still cheap. Some of the artists turned out to be huge successes, others you've never heard of. They did this for decades and they were really good at it. Despite living in a small one-bedroom apartment they eventually filled it with 4,000 minimalist paintings. Their collection is valued in the millions, but they've never sold a single piece for profit. They clearly aren't your stereotypical art collectors. They like it for the beauty, not the money. Now obviously anyone who obsessively amasses a collection of that size has a few issues, but that doesn't stop them from being the cutest little old couple I've ever seen. It's so easy to tell they still really love each other after all of those years. Everything about this documentary made me happy. I don't think I've ever said "awww" so much during a movie. If you have interest in the art world at all or just like smiling at cute little elderly couples you should really give this one a try. It's my feel-good pick of the year. Why is it in your queue? Sounded like a cute documentary, it was. Is it artsy? It is about a couple of art collectors but I wouldn't call it artsy. What stood out the most to you? Five semi trucks full of art. What mood should I be in to watch this movie? Happy and looking to be even happier.